I met the guys at Three Flip Studios at GDC a few years ago, and we’ve been indie dev buddies ever since. 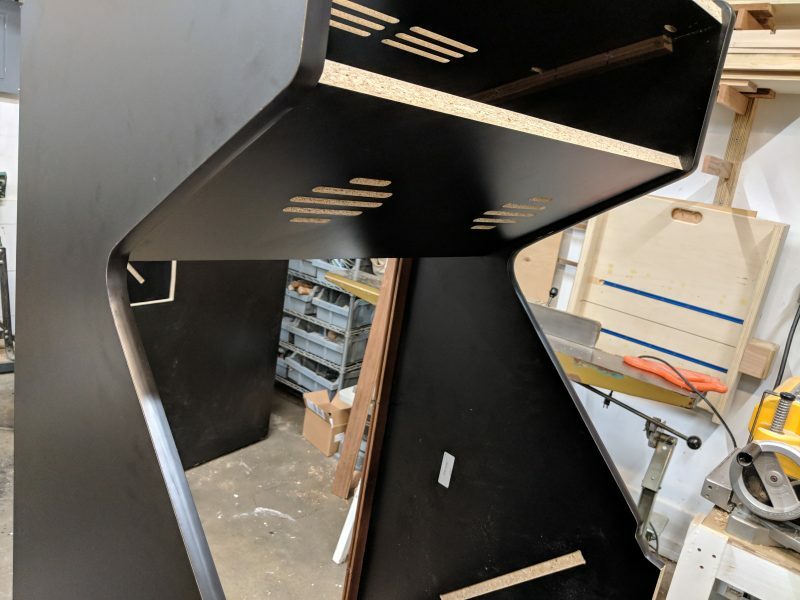 So when Rob asked me if I was interested in building a Super Slam Dunk Touchdown arcade cabinet, well of course I said “yes please immediately let’s do that”. 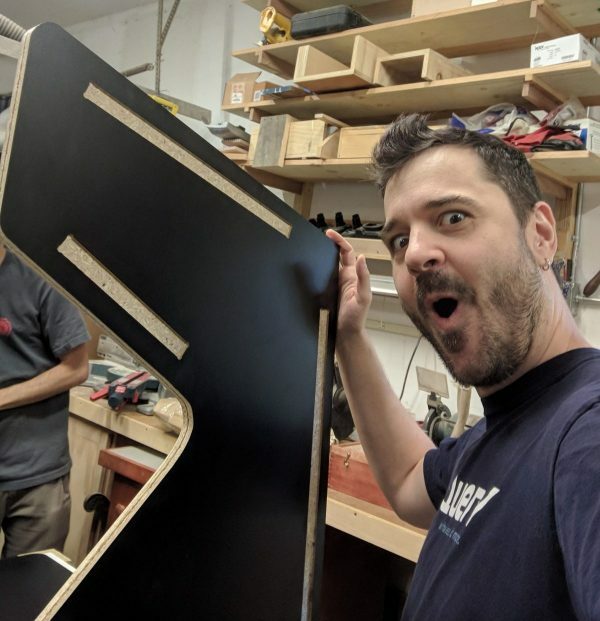 I ordered the parts I needed and was on a plane to build an arcade cabinet, with near-zero woodworking experience. I left these guys at home! It was my first time doing something on this scale, so I was mentally prepared to make some mistakes. 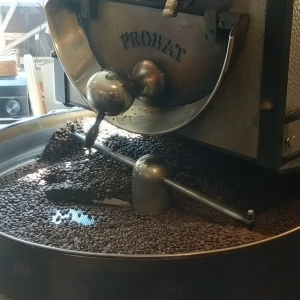 But first we needed coffee. The next stop was the wood shop, where a fantastic array of tools was at our disposal, thanks to some skilled and well-equiped friends of Three Flip. 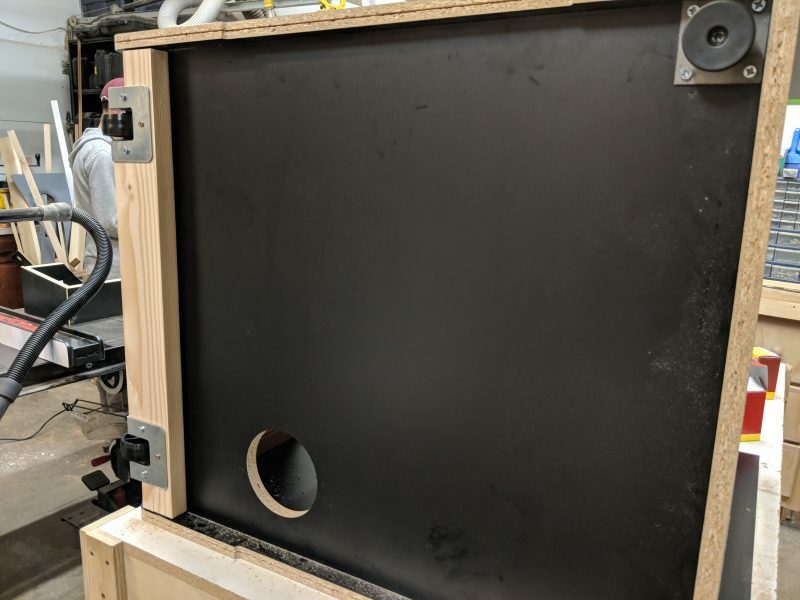 Three Flip had already hand-created their cabinet shell most of the way, and had determined that a better way to do it was getting the pieces done by a CNC machine. The plans that they went off of were sent to me, and I was the guinea pig for the CNC version. The CNC place sent the pieces to Three Flip and they were there when I arrived! The pieces looked pretty fantastic, with only a few rough areas. The control panel looks great! The plans were for a 4 player cabinet in the style of The Simpsons arcade machine from the 90s. They were also for a 2 button layout! So I had to figure out the weird angles going on with the 2 button layout and apply it to a 3 button layout. 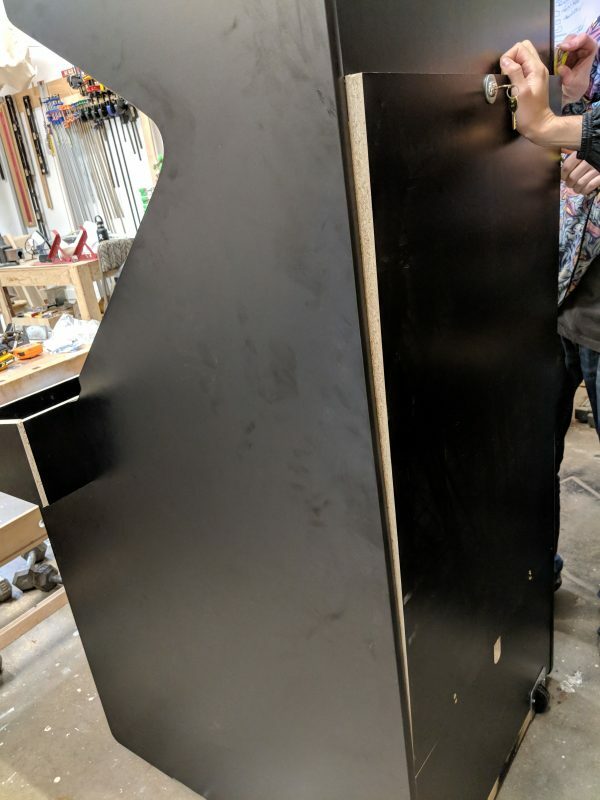 A 6 player cabinet would be awesome, but also very large, heavy and hard to deal with. I would prefer two linked 3 player cabinets if I was going that route. As it is, arcade mode will be designed for four players, split on two teams. But getting back to the button layout, it looks kinda crazy! Here’s how I made sure it was correct. If there were only one player, the controls would be centered and in this arrangement. 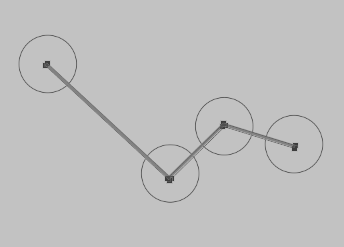 The guide line shows the relationship of angle and distance for the different buttons. By rotating this entire group, we can make sure each of the 4 players is roughly pointed towards the screen. Rotated button group… TO THE EXTREME! Yes, I opted for a 3 button layout. It’s a 4 player cabinet, so I decided that switching with the computer player will be automatic, and matches will always be 2-on-2. This leads to a simpler control scheme, and the game is more accessible to play with fewer buttons. 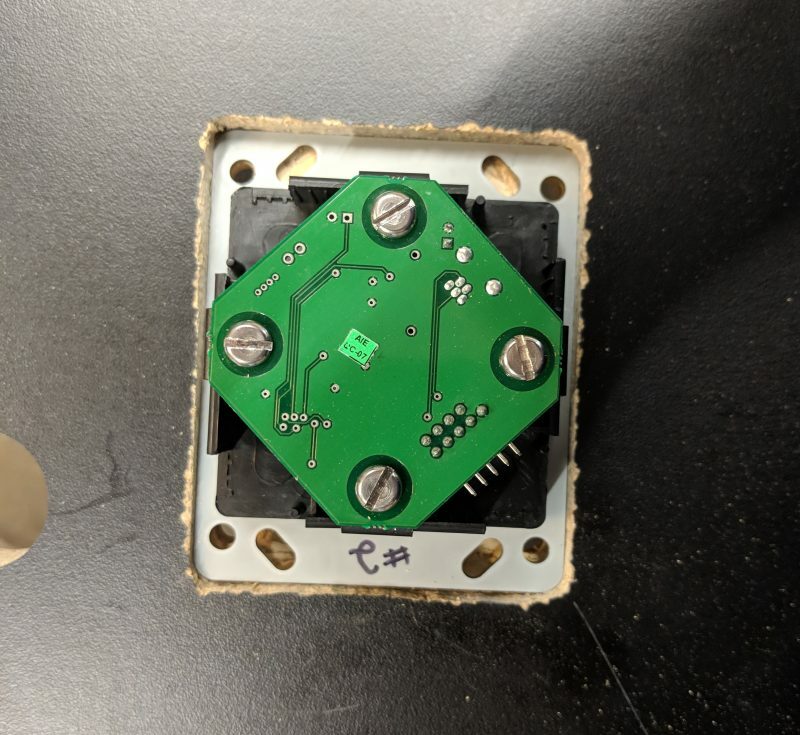 The first step of the day was building the control box. This involved drilling pocket holes and using glue. 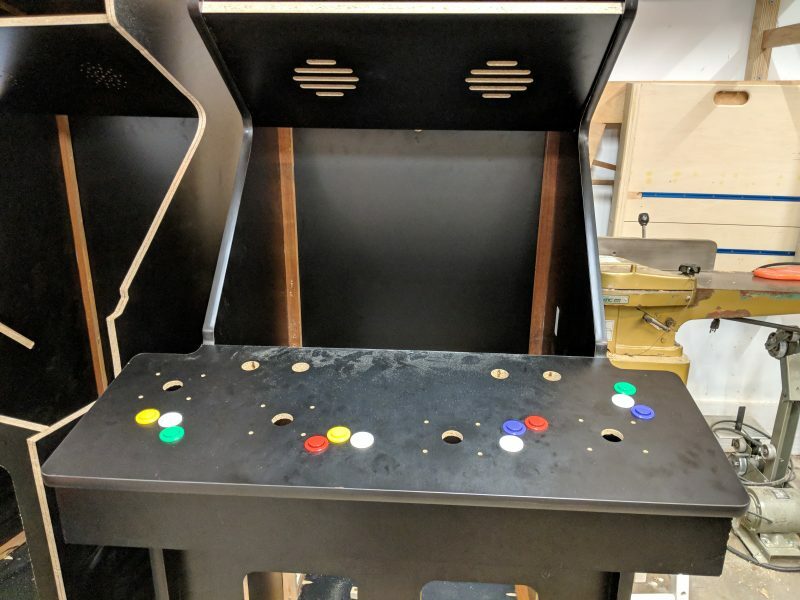 The old school 4 player arcade cabinets back in the day were just glue, so this cabinet should be pretty darn sturdy! The pieces fit like magic. 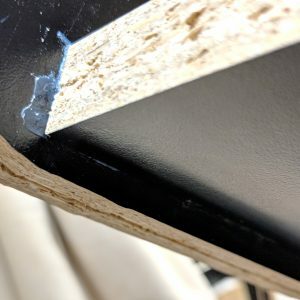 The pocket holes let us put screws on the inside of the cabinet, so the outside is pure, delicious melamine. Did I say delicious? I meant to say it causes cancer. Wear your masks people! Melamine is brittle as hell too, so all the pieces started picking up chips immediately. This ensaddens me, but a dinged up cabinet is still better than zero cabinets. 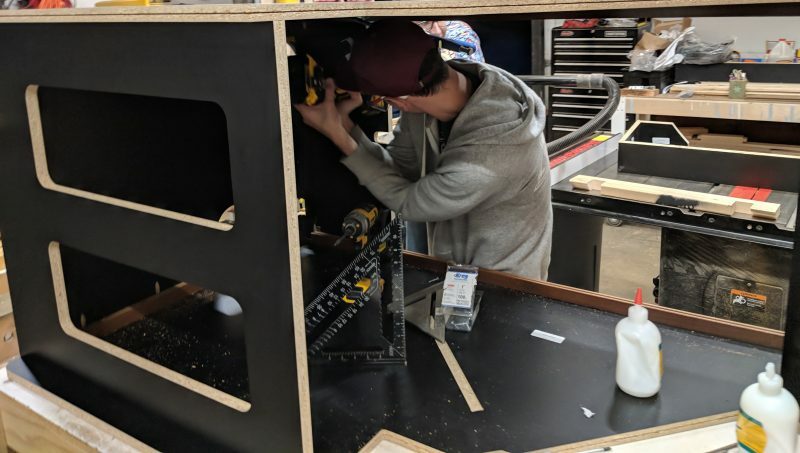 Once the box was built, I put on the control panel top for the first time. Did i mention I added start buttons? I ran into my first goof-up. I had to add start buttons to the panel, but didn’t know how far in the control box would be. I thought I was being generous with my estimate, but there was still overlap with the player 3 and 4 buttons. It wasn’t anything we couldn’t fix however! Another issue was that the joystick wells were exactly the right size, which in the real world means it won’t fit without a hammer. I took a chisel and went about the long task of chipping out a bigger hole for each stick so that they would fit tightly, but could still be removed if needed. I went ahead and did this for Three Flip’s panel too. I mean, it’s the least I could do! Next up was preparing the back and bottom of the cabinet for wheel installation. 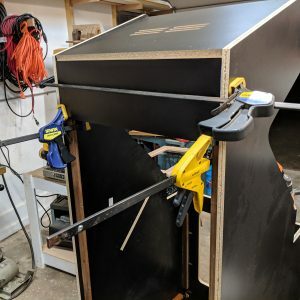 The back of the cabinet needed wheels, making it easier to move around without a dolly, and more convenient to position and work on in the shop. 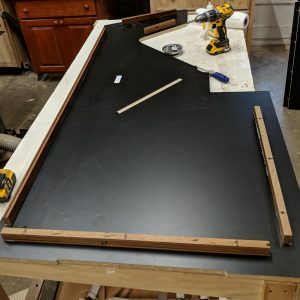 We started with a hole that our electrical hand saw thingy could use to get started. Additionally, we needed to install a 2×4 for the wheel. We cut out a wheel well in the 2×4 and the wheel fit pretty, well… well. 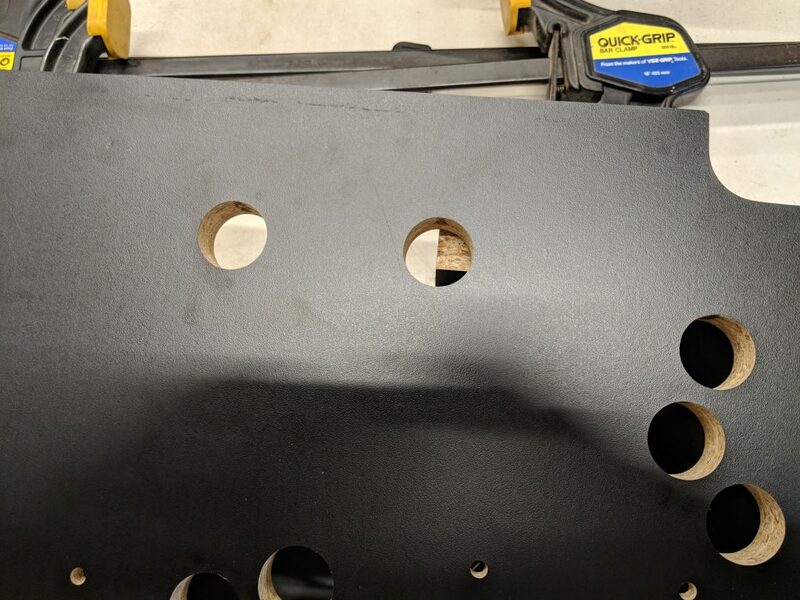 There was a slight issue where the screw holes didn’t line up, so we drilled new ones by using oil on a drill bit, presumably to keep metal shards from flying into your eyeball. Metal shards are not fun in your skin or lungs either. The next day we were set to put the cabinet together. Step one was the blocking. The one in the middle is for a CRT. Oops. 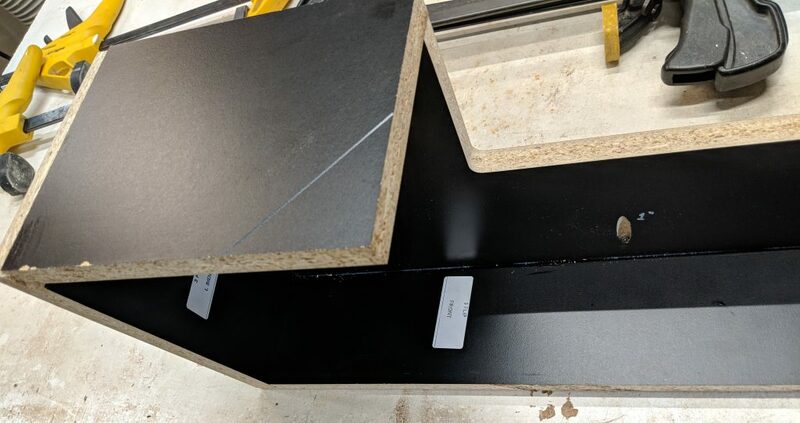 The cabinet pieces came with pre-cut slots for the blocking pieces to line up into. The blocking wood we used were some floor scraps that was a nice hard wood. They are very sturdy and frame the pieces so they can fit together as one unit. We cut them to size and then had to pre-drill holes, because the wood was too hard to drive a screw into alone. This is probably overkill for sturdiness, but who am I to say no? Like Voltron, all the pieces had to come together. This involved a lot of pocket holes, Roo glue and screws, just like Voltron! Not to mention 3 people making sure it didn’t collapse during construction. This was definitely the most stressful part of the building process! Once it was all finished we needed to install the feet and wheels. 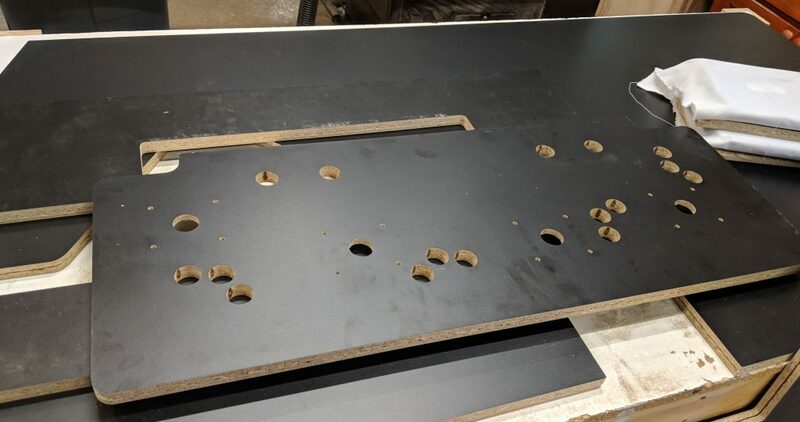 The feet needed holes drilled in the bottom of the cabinet. The wheels were all set with the new screw holes. After the glue set, the cabinet was finally ready to be set upright. 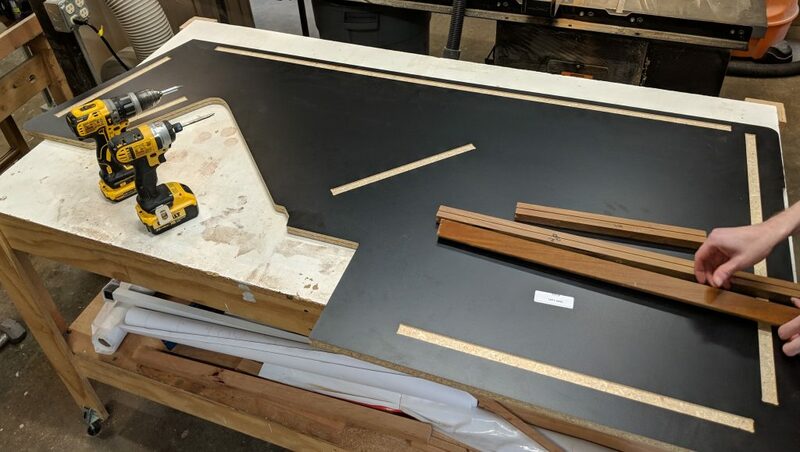 Then we could attach the last piece to be connected: the top, non-removable, portion of the back panel. 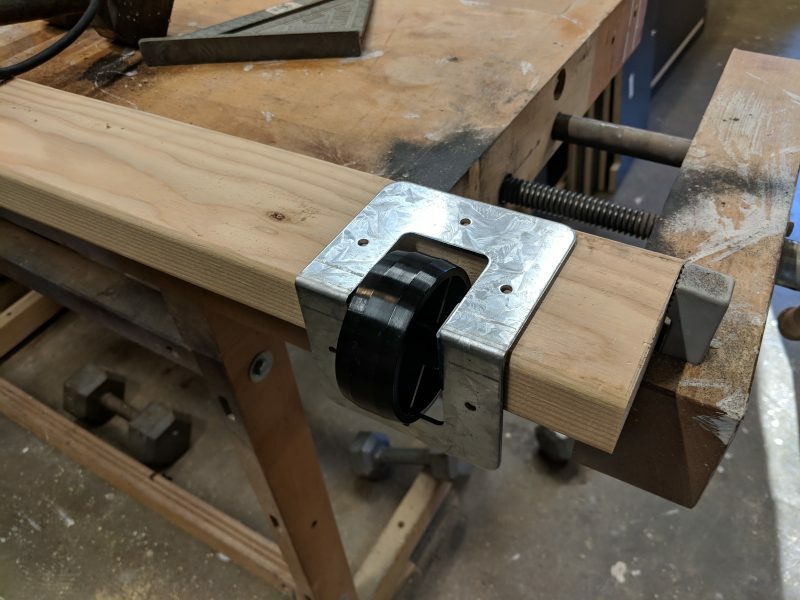 Clamps are your friend! We used a lot of them while the glue was setting. They come in various sizes and keep everything nice and tight. It was an exciting moment when we plopped down our control boxes and had the two cabinets side by side! This was the end of a very busy day of building, and we went to get some pizza to celebrate. The next day we took some much needed R&R. I bought a soccer ball at the sports store on the way to a park nearby. Can you believe I don’t have one? It really helps me to have the physical ball in person, to help judge if the physics in the game is correct. I also bought a hockey puck which I didn’t have and a street hockey ball. The puck has got me rethinking my puck in the game. A real puck will very much roll on its side on occasion, a behavior I had originally sought to eliminate. I think I need to adjust it to make that behavior possible, but rare. As for the street hockey ball, no promises, but the street hockey ball could be an interesting addition to SSDT. It combines light weight, small size and a very low bounce. 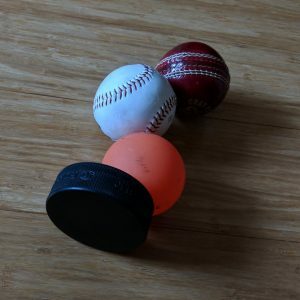 The bounce is slightly higher than a baseball, but street hockey ball is lighter and is lower friction. Since field hockey balls are typically one solid color, adding it to SSDT should be a piece of cake. 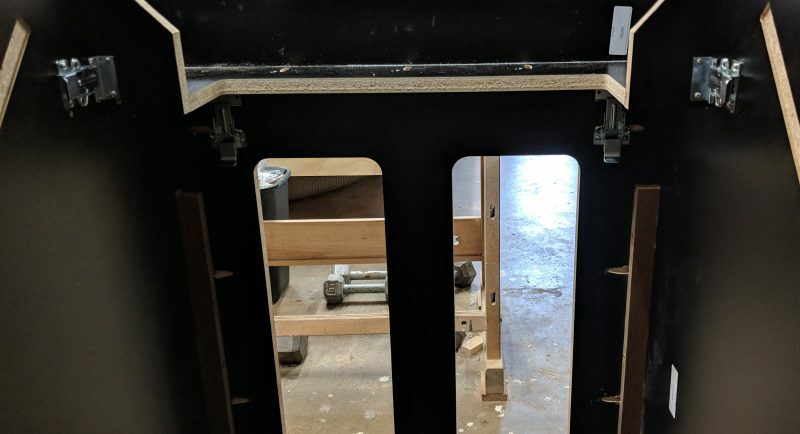 After getting some exercise in the park and grabbing some food, we went back to the wood shop to put on the T-molding and control panel latches. The melamine panels had groves cut along the inside so we could put T-molding in easily. On the inside front curve of the cabinet however, we noticed some flaws. The last step of our rest day was to install latches on the inside of the cabinet and to the control box. 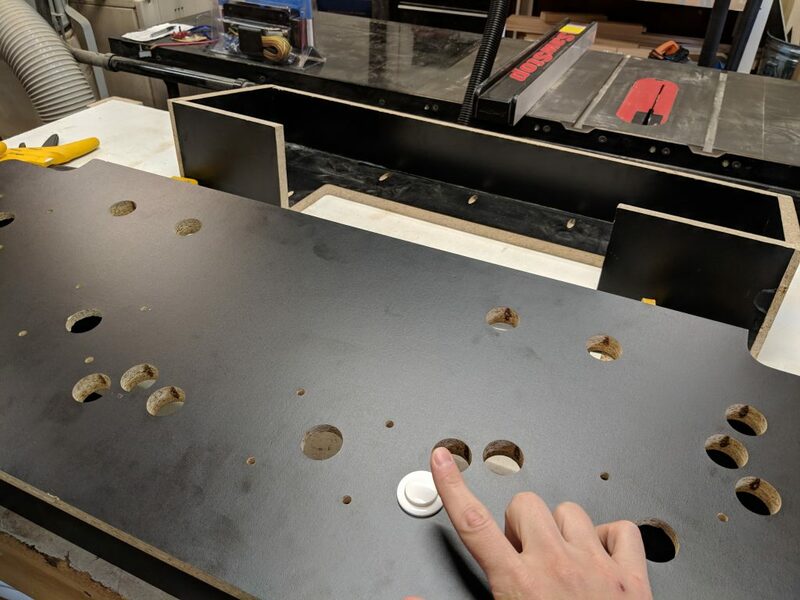 This way, the control box can stay fixed to the cabinet during play, but can also be completely removed! 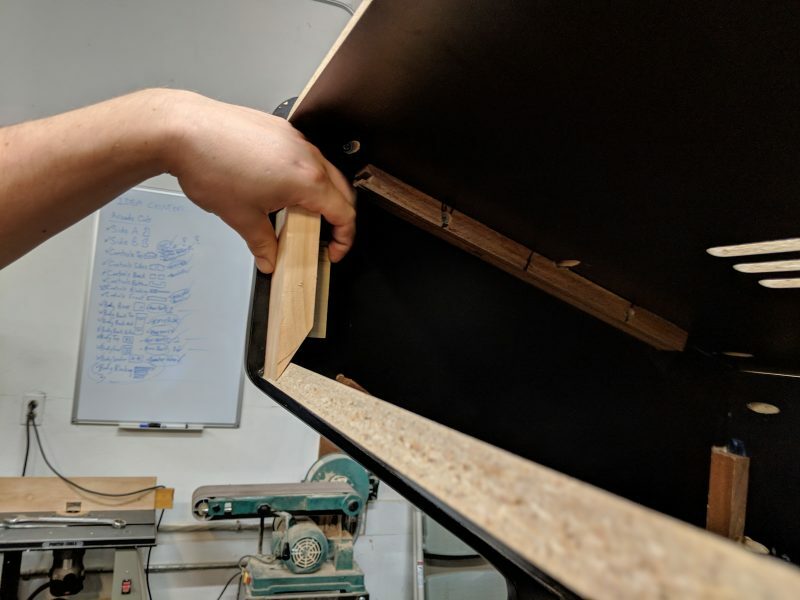 This is a great feature because it enables the cabinet to be narrower during transport, not to mention I can work on the control box more easily when it is a separate piece. First though, we had to fix a design flaw where the panel didn’t fit nicely in the groove cut for it. Once that was done, it was ready for latches. 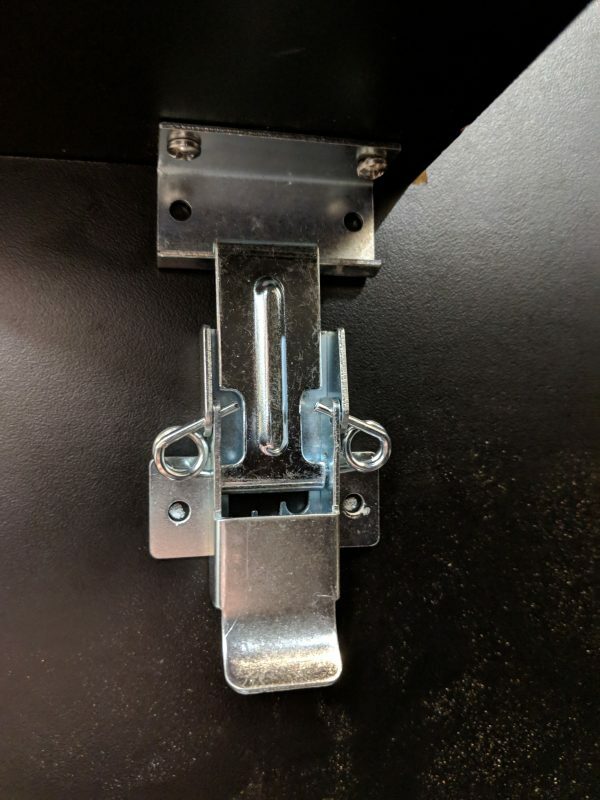 Initially each cabinet was going to use only 2 latches for this. But we quickly figured out it was going to be loose with only 2 connections. Instead, we selected locations for 4 clamps to hold it both down towards the floor, and back towards the cabinet. 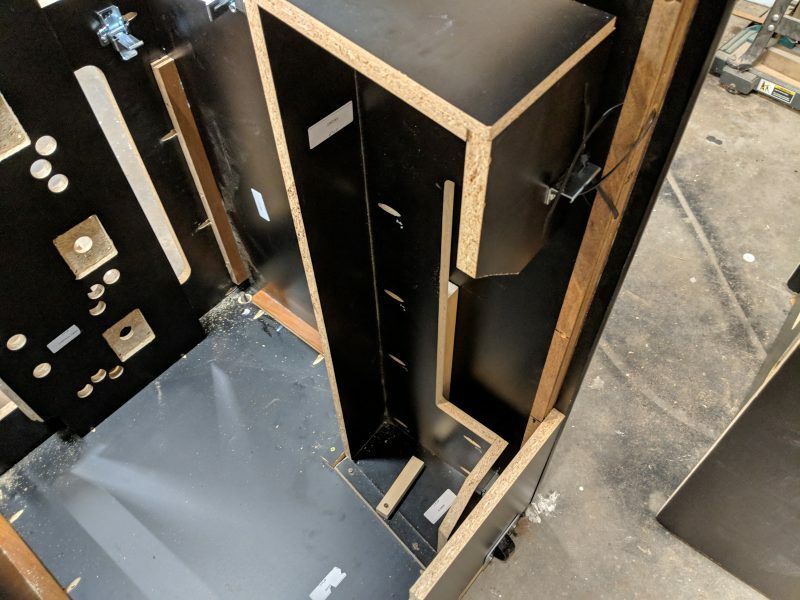 This meant we’d need to order more latches for the control boxes, but once all four latches were installed the panel clamped in and was totally solid. Release four latches and it comes off. It’s super easy. Somewhere along the line, something went wrong. The back panel was a bit too tall. We figured this out after installing the lock and drilling the guide holes for the brace that holds it in. It was a simple enough fix though. With everything ready, it was time to try to figure out how to ship all this stuff! I had the thought to install some guide rails using wood scraps for the control box. I also drilled some holes into the backing piece for zip ties. This seems to secure it reasonably well, but the plan is to wrap the panel in bubble wrap beforehand as well. These rails can be discarded once the cabinet arrives at Tipping Goat. 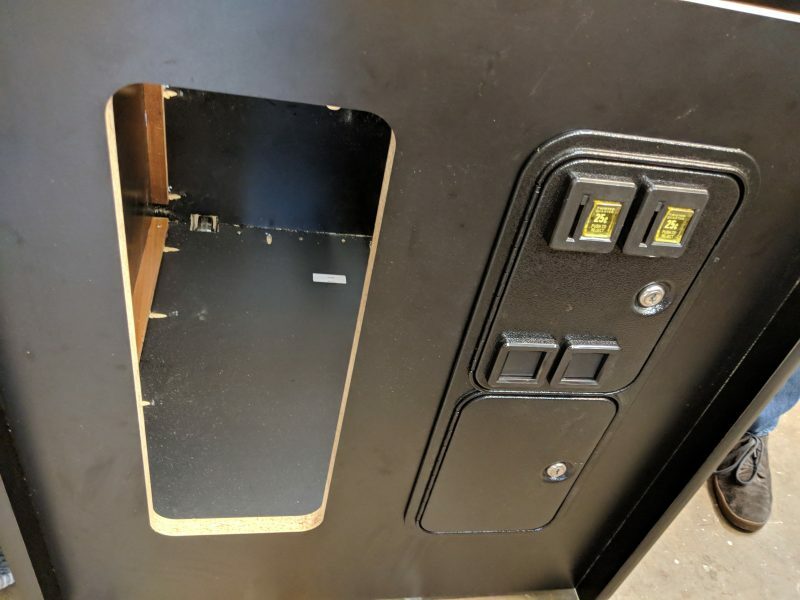 The control panel can be wrapped and zip tied to the front of the cabinet. This way the whole package all fits neatly on a pallet for shipping. I hope this will hold it! 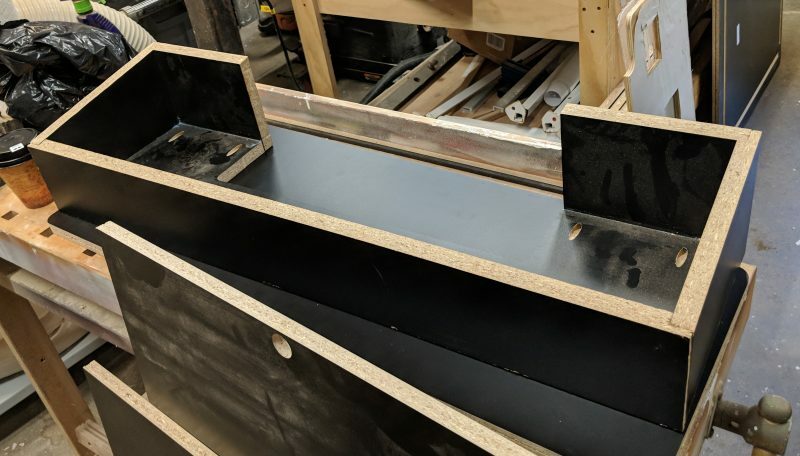 Three Flip has been kind enough to handle the wrapping up of all the parts and the cabinet, securing it to a pallet and getting is shipped out. Fingers crossed! For whatever reason, these pieces were not designed correctly for a marquee to fit in nicely. The wood should have been cut on the top and bottom of the marquee pieces so the fronts would be aligned vertically once installed. I will have to figure out a solution. 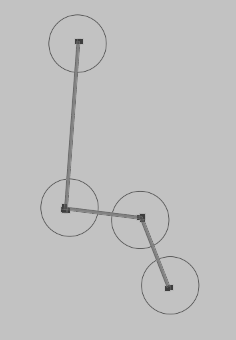 One possibility is shown in the photo above: Installing support rails, and a guide piece with an angle cut on it. Then the marquee could be attached to the guide piece. Combined with a bent L piece, it might look OK and be secure. This portion of the cabinet build was pretty quick. The pieces mostly fit from the start, and Three Flip already had the hands on experience of making most of their own cabinet. The remaining issues haven’t been solved for either team, and the cabinet will be shipped to me to actually complete by myself. 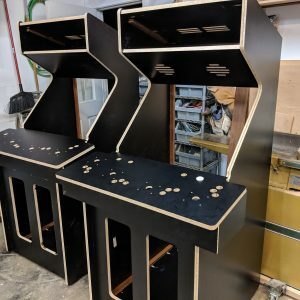 Three Flip can continue to collaborate with Tipping Goat on getting the cabinets finished, but this will turn into a side project for me while I get back to Season Mode and the Xbox One port. SSDT: Arcade Edition (part 2) is TBD!